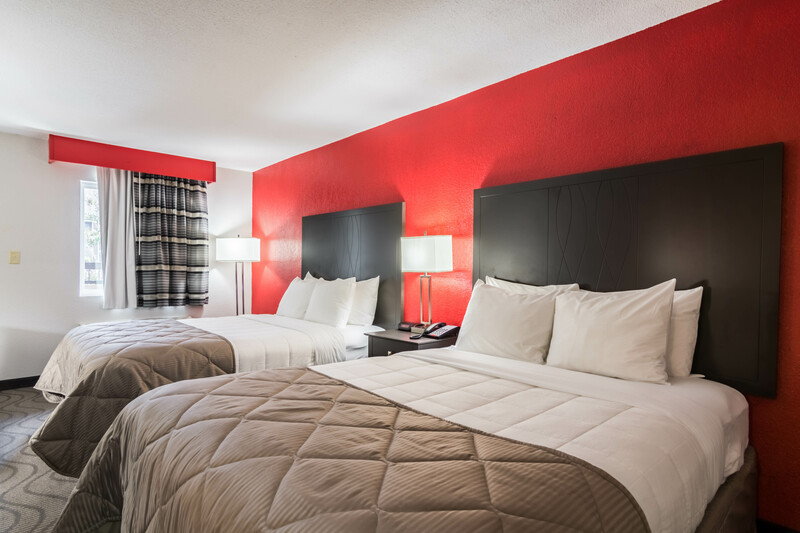 Enjoy a taste of home on the road when you stay at our bright and well-lit lodgings in Russellville, AR, featuring colorful design and modern furnishings. For busy travelers on the go, the microwaves and mini-fridges in each room are perfect for storing a snack or reheating food. Look your best with a pristine and large bathroom, which includes an iron and ironing board, hairdryer, and recently updated amenities. Enjoy a fresh start to your day with the coffee maker in your room, as well as freshly dry-cleaned clothing from our dry cleaning valet services. Head down to breakfast in our breakfast lounge area for a full breakfast buffet. Learn more about our amenities and hotel features! Book your room with Choice privileges to collect points while you sleep. 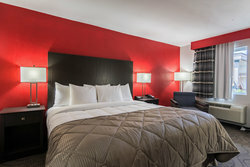 Points can be redeemed on travel, hotel stays, and so much more. 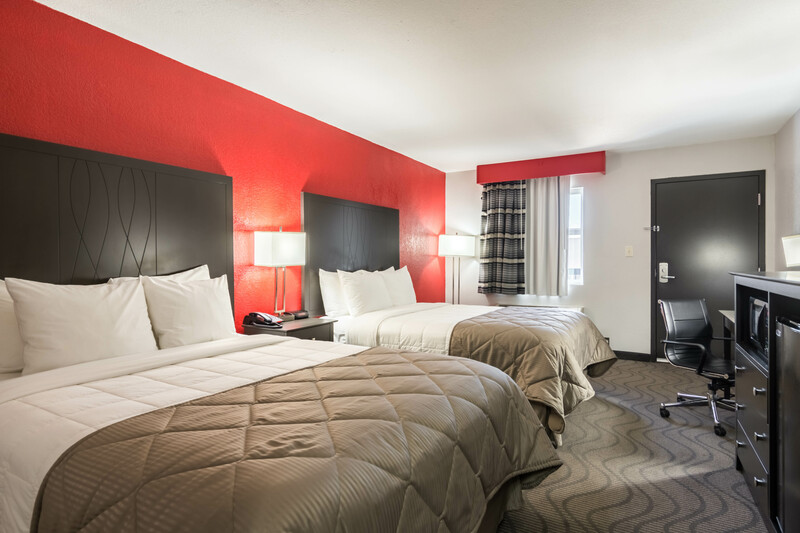 Lodging in Russellville, Arkansas with us provides you with the ultimate home away from home experience. 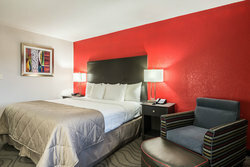 Our 1 King hotel room in Russellville, AR provides colorful comfort in the heart of the Ozarks! 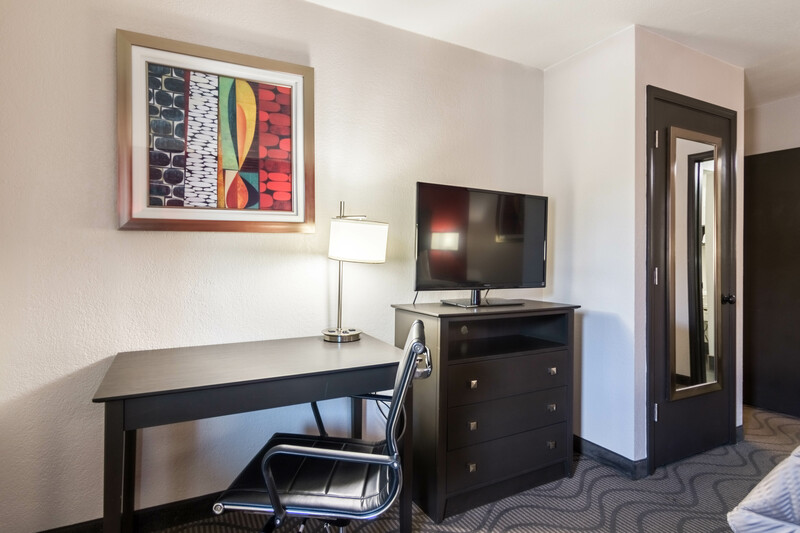 Enjoy space and convenience, with outdoor corridors and extra-large free parking spaces. 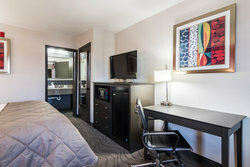 Each room includes new furnishings, including an ergonomic chair and desk. This room is available both smoking and non-smoking. 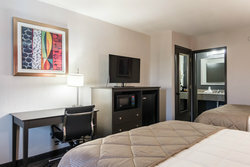 This mobility-accessible 1 King Room has lots of space for solo travelers and couples. This ADA-compliant room has a large roll-in shower, grab bars, and visual assists. 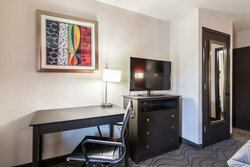 It also features new furnishings, including a desk, ergonomic desk chair, and armchair. Your whole group will enjoy a peaceful night in this spacious room. 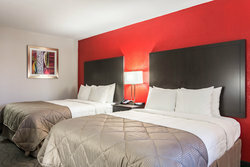 Our 2 Queen Beds rooms features modern, updated furnishings and recently upgraded bathrooms. Settle back in bed and watch the 40” plasma TV with sports channels, HBO, and more. 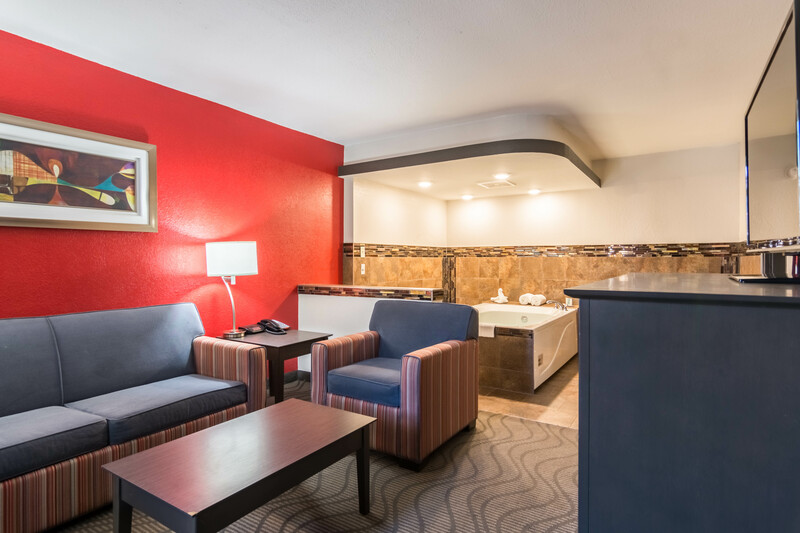 Enjoy some extra space in a King Suite with a separate living area. The sitting area’s sofa converts into a sofa bed, for added flexibility. 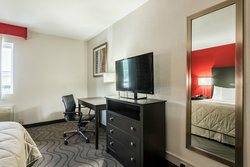 Settle back in bed and watch the 40” plasma TV with sports channels, HBO, and more. 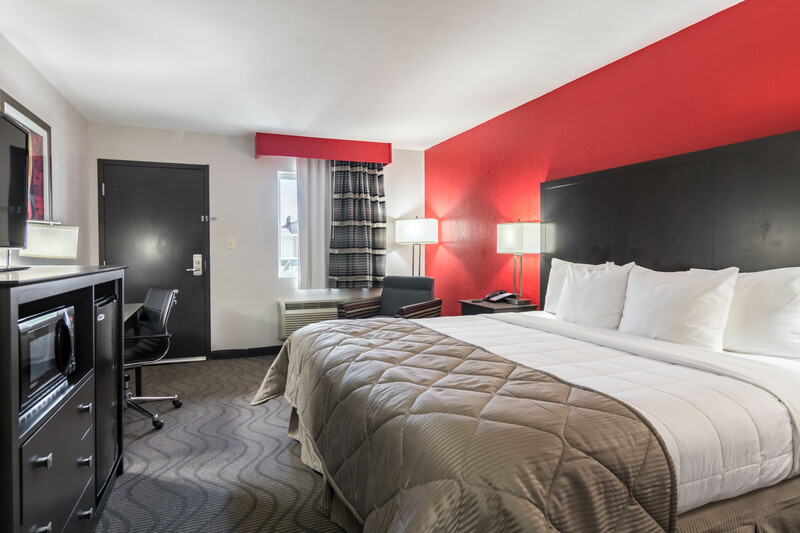 Your home away from home awaits! This lodging in Russellville, Arkansas is some of the largest around, with a separate living room area. The sitting area includes a pull-out sofa bed and an accommodating washroom making it perfect for groups. 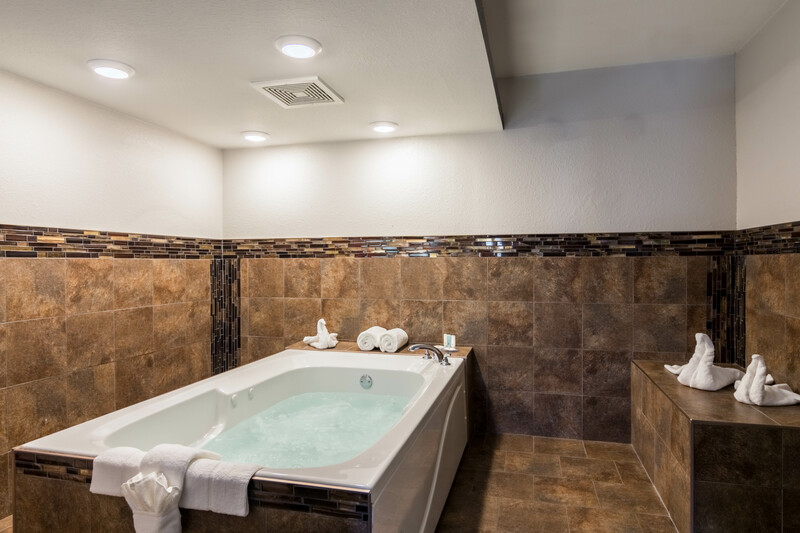 Our 2-person whirlpool baths will help you relax and unwind in peace at the end of a busy day! Bubble away your troubles in this lodging in Russellville, AR which comes with a separate sitting and bedroom areas. 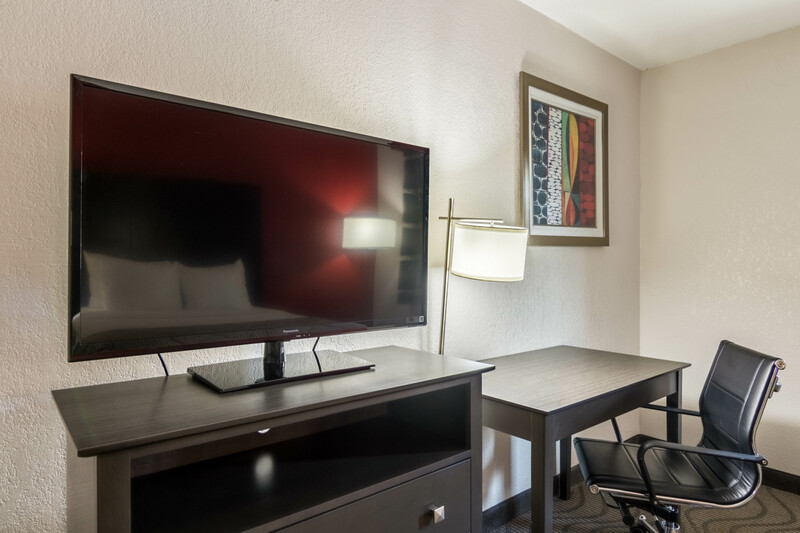 Settle back in bed and watch the 40” plasma TV with sports channels, HBO, and more. Larger groups will love the space and comfort of the 2 Queen Whirlpool Suite’s larger space and the luxury of a newly upgraded whirlpool tub. Settle back in comfortable queen beds and premium linens, with a 40” plasma TV playing premium channels like HBO, sports, and more. 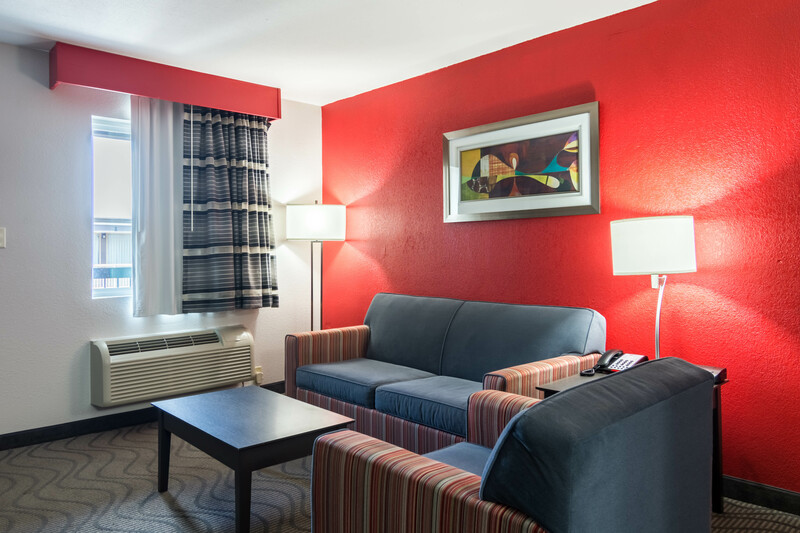 Take lodging in Russellville, Arkansas to the next level with this spacious suite!